Unnoticed in the Western world, the renewal of the Lancaster House Treaty by London and Paris creates a super “Entente Cordiale” which is far more immersive than the Treaty of 1904. It participates in the re-institution of a bipolar world, and will inevitably provoke the exit of France from the European Union and the return of tension between Paris and Berlin. In 2010, David Cameron and Nicolas Sarkozy decided to associate the projection forces of the United Kingdom and France . By « projection forces », we should understand “ex-colonial troops”. The Lancaster House Treaty featured several appendices, one of which planned for a gigantic joint exercise called Southern Mistral. Several months later, it turned out that the exercise had been transformed into an effective mobilisation of the same units, at the same date, for a real war against Libya, under the name of Opération Harmattan (literal translation of Southern Mistral) . At the time, this Franco-British initiative was piloted by Washington, in application of its strategy « leading from behind ». The troops of France and Britain were posted centre stage, while in the wings, Washington handed out their specific missions. The Lancaster House Treaty was aimed at creating a legal framework for interventions such as the attack on Libya (which was still to come), and joining forces with an eye to economy and efficiency. This choice supposed a genuine revolution – a common foreign policy. However, the impulse given by the Treaty and the expedition against Libya were progressively dissipated by the nervousness of public opinion and British diplomats, which followed the Iraqi Resistance to the Anglo-Saxon occupation . So, as from 2004, the United Kingdom began to prepare a new « Arab revolt » as they had in 1915, under the name « Arab Spring » , then refused to bomb Damascus. Currently, London is busy reorganising its Defence after Brexit, after Donald Trump refused to continue to manipulate Islamist terrorism, and after Russian implantation in Syria. While the Treaty negotiated by David Cameron and Nicolas Sarkozy may seem to have been no more than an opportunity to wage war on Libya, the restoration of the Treaty by Theresa May and Emmanuel Macron is the fruit of a carefully thought-out choice made for the long term . This new stage was negotiated by President Macron’s mentor, Jean-Pierre Jouyet, the new French ambassador to London. London and Paris are both seated at the UNO Security Council. They both have nuclear weapons. Together, they have a military budget which is 30% superior to that of Russia (but inferior to those of the United States and China). By choosing to privilege its military alliance with London, Paris is moving away from Berlin, which is preparing its own rearmament and hopes to take the leadership of the other European armies . If this process continues, Paris will in its turn be obliged to leave the European Union, of which Berlin is already the de facto leader. The declarations of Emmanuel Macron, and the creation by Theresa May of a military unit against Russian « lies » , announce the return to a bipolar world and the censorship of information from Moscow. 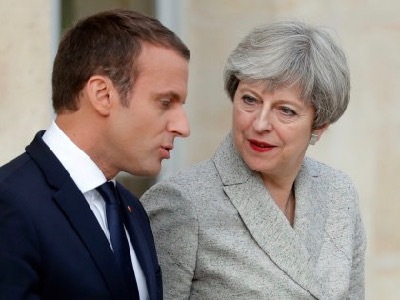 And the abandon of the Franco-German couple for a Franco-British Entente announces the return of much-feared tensions between Paris and Berlin.